The Texas League began in 1902 and has been one of the longest running Minor League systems in history. 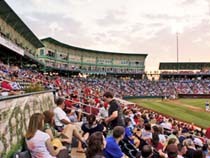 With the exception of a 3 year break for World War II, the Texas League has played on continuously for well over 100 years, serving as the Double-A entry for 8 Major League franchises. Today the Texas League has expanded to include Arkansas, Oklahoma and Missouri as well but maintains at least 4 teams in the state of Texas.